Angels & Demons is a book and a movie, sequel to the DaVinci Code. The title was inspiration for our final project in Illustration Techniques class. Most of these students are sophomore C.D. majors, not necessarily Illustration majors. This course involves mastering traditional media: pen and ink; scratchboard; watercolor; and for this final project, acrylic paint. Of course, the class asked to see past students’ work. Well, I mix it up to keep it interesting. 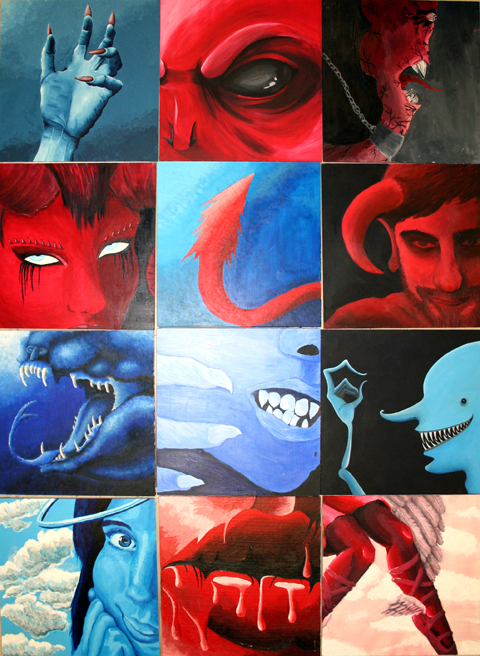 Last year was “Rare Birds” so I had no “Angel and Demons” to show. At the end of the semester students are running short on cash, so I treated them to the masonite and gesso. They had to provide the paint. Limiting the palette saved some money. I got two 4ft by 8ft sheets of masonite (about $11 each) from Lowe’s, cut into 12 inch squares. Project instructions: Your Angel or Demon should be largely monochromatic, with red or blue the dominant color. Close up, a telling detail, not full figure. Imagine the light is coming from the upper left. Angels or Demons can be either blue or red. No color code, but largely one or the other. Grading criteria: Originality, sense of mass, and consistency of light source. No points for originality if you lift a cherub from Rafael or devil from Bosch. Better to find a baby picture or photo of a wicked-looking person for reference. Even better –take your own reference photo of yourself or a friend. This was a two-week project and the results were fascinating when grouped side by side. We will do Angels & Demons again next year. If you teach illustration, feel free to use this. Let me know how it works! 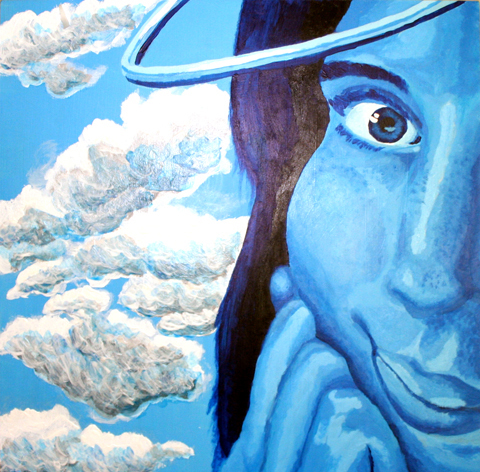 One of our better angels by Bill Collier. Next > Nate’s New Graphic Novel is Free, but You Can Buy It!